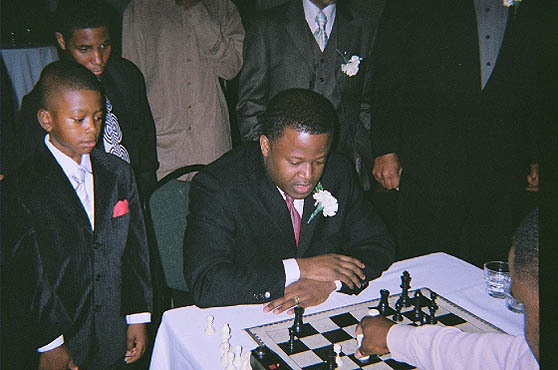 GM Maurice Ashley playing blitz with Kasaun Henry while onlookers take note. Photo by Kevin Fite. Detroit City Chess Club held its annual dinner banquet at the Detroit Yacht Club on Saturday November 3, 2007. D3C's guest speaker this year was International Grandmaster Maurice Ashley. Before the spectacular event Saturday night, IGM Ashley visited Bethune Academy on Detroit's Westside. IGM Ashley gave a riveting speech to 30 students about dreaming big and holding on to that dream. After the speech, IGM Ashley played all 30 students in a Simul chess match and beat all students in less than 20 minutes. The following morning, IGM Ashley visited the Skillman Library in downtown Detroit home of Detroit City Chess Club and gave a brief speech about attaining your goals and then began a 34 student Simul against D3C players. IGM Ashley successfully finished off all 34 students just under 3 hours. D3C players came from Detroit's National Chess Champions Detroit Duffield, Bates Academy, Cass Tech High, University of Liggett, Cornerstone Academy, Southfield Christian and Eagle Creek Academy. Later that night, D3C honored individuals who gave support to the club in various ways. The individuals included Dr. Joann Watson (Detroit City Council), Anthony Spencer (President of SpencerDailey Inc a construction firm), Gwendolyn Esco-Davis of (The Hascom Group, LLC), Tyrone Winfrey (University of Michigan), Caldonia Anderson of (UAW), Glenn Smith (Chess Coach), D'Metrius Wilson (D3C player of the year). IGM Ashley told the crowd of over 100 people about his humble beginnings in Jamaica and his transition to the United States when he was 12. He made mention to the young chess players in the audience that if you want to get ahead you must read and play as many strong players as you can, even if you lose a lot. After the dinner, IGM Ashley stayed afterwards to play those willing to challenge him in a game of Blitz. It was a magnificent event.